MultiMode 3, or MM3 modchips are very popular, and should work with every version of the PlayStation 1. They can be made using PIC12C508A, PIC12F629, and other PIC chips. This guide covers everything you need to know about choosing, programming, and installing an MM3 modchip into your PlayStation. This page covers the MM3 modchip. It includes general information about the chip, and then links off to installation guides for each console model. The biggest problem with MM3 chips is how they base their timing on the internal oscillator within the PIC chips. Using the internal oscillator can sometimes cause the chip to become out of sync with the console when booting, meaning you’ll have to restart the console to boot. Certain PIC programmers can also mess up the internal oscillator value when programming, which could be a problem if you are programming your own chips. Additionally it has been reported that certain batches of PIC chips have had problems with the oscillator value in the past. The MM3’s greatest strength is its compatibility and popularity. From my experience it is the single most popular PS1 modchip being used today. Because of this you’re more likely to find people who can help you if you are having problems installing your chip. Additionally the MM3 is compatible with most PS1 consoles and can play anti modchip games if you install all seven wires. The only system that you definitely shouldn’t install an MM3 in is the SCPH-102 (install a ONEchip instead). If you’d like to program your own MM3 modchips you’ll need the source code. Right now I only have the code for the PIC12C508A and the PIC12F629. If you have the code for other PIC chips let me know and I’ll add them to this post. The MM3 chip has three different versions, one for each region. If you have an American system use the USA version, if you have a European system use the EUR version, and if you have a Japanese system use the JAP version. I’ll have a tutorial on how to program these PIC chips in the future. All MM3 chips I sell are preprogrammed. I sell preprogrammed MM3 modchips on my store. The shipping is calculated by weight so if you buy more than one chip at a time you’ll be able to save some money. I currently only ship chips to the United States. If you’re located in another country I recommend buying from EurAsia. They sell genuine chips for a good price, but shipping is fairly slow. I sell both premodded PS1’s, and MM3 modchip installation services on my eBay store, as well as my store on this website. If I’m interested in trying to program my own mm3 mod chip, do you have a recommended PIC programmer? Did you buy one or make one from scratch? What software do you use for the .hex files, etc? 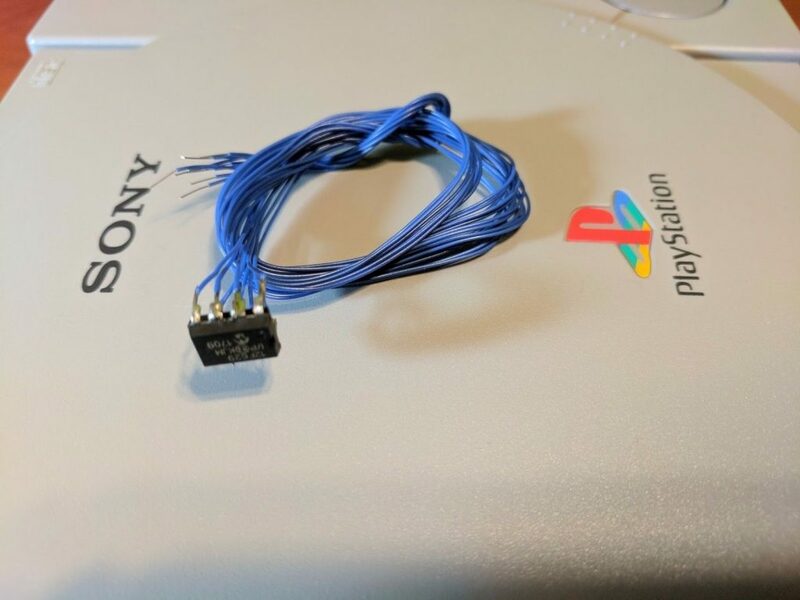 How do I verify that it worked correctly, before soldering it to a PS1. I have a question, can I write the 12C508A program code into a 12C509A microcontroller, and use the same wire diagram? Thanks for your attention. Yes, the MM3 hex files linked above work with 12C508, 12C508A, 12C509, and 12C509A. The wiring diagrams will be the same. Excellent then, thank you very much for the quick reply! I’ll work on it next weekend and give you a feedback. The ones I sell do come pre-programmed. The PsNee chips tend to work better for the 1001. The Pic12C508A is recognized by my TL866. Any special way to load and write the hex file? Thanks. You should be able to just import the hex file and click program. Cool, just like my SNES projects! Thanks.